Recibí el pedido completo. ¡¡Que haría yo sin sus productos!!. I was going to Svalbard, -15 degrees and permafrost. Used toewarmers and did not have cold feet. Super easy to use and all worth the money. These toe warmers makes the difference between skiing and staying inside when the temperature has dropped below -20°C. You don´t really feel the heat, just no cold and they last for a full day too. Give your kids a pair of toe warmers and the whole family can feel the benefits! Delivery time was a couple of days - from Germany to Sweden with DHL - very good! Such a great product that is all natural, effective and long lasting! Very good item.Keeps my feet warm many days on the year.Fast delivery. Thanks. Used my feet warmera cooled day skiing. It was warm and nice all day long. Those are great during could days in the slope! These foot warmers are effective, environmentally friendly and slim enough to wear comfortably. Have tried several other brands and these so far are my favourite. Helfen sogar bei extremster Kälte. War damit in Oimjakon, dem kältesten Ort der Welt, bei minus 57 Grad Celsius. Kann diese Wärmepads wärmstens empfehlen! My moteher always has very cold feet. I bought this product and now she is enchanted. Highly recommended. I am a fan since years now and these products follow me all arround the year as I am travelling and when I ride my motorbike. I would not be able to live without. Delivering and packing always satisfying from Heat Company, thanks! Very Good item for my feet. Very good product for my cold feet in the winder and autum and spring. Just like the insole warmer after 8 hours still warm. Warm toes in the snow after 6 hours. Keeps my feet warm on cold days. I have bought it for my kids, they love it, and since then they do not complain when they are skiing. I always HAD cold feet (toes) during my winter cycling tours. On my race bike or on my cross bike no matter the socks and overshoes always cold feet. On my roadbike, around 0 Celcius, my feet are warm for 5 hours ! No longer cold feet. Excellent. Have recommended them to several friends. Ideal for the kids too. condition that affects people with my circulation problem..I have used your toe warmers for three winters now and they have been a success.. The ordering process has been first class and very prompt delivery I will be ordering again in the latter part of the year for next winter.. many thanks. I use footwarmers on cold days and pedaling comfortable for 3 hours. I recommend windstopper neoprene covers for keep temperature. very good to keep you warm. stays warm for 8 hours and fits perfectly under the socks. was delivered on time also. These keep my kids warm on their feet during soccer training outside in the wintertime! I use them for more then 6 years. I put them under my toes and I not above. The only problem I see is to provide enough air to toewarmer to work at full power in ski boots. But anyway they help me to stay warm also if the temperature is below -10 deg. I am really grateful to " The Heat company" to having had the opportunity of buying such a useful article, i.e. "Toewarmers" to protect my feet against the freezing cold. Using them my feet are warm again and I don't feel any cold while being outside walking, cycling or playing. really a great product. And this year with 8+ even better. Congratulation. Have a success in the future and happy New Year. A good idea but I find I have 5 that do not heat up as hot as the others when used in the same climate and using the same shoes. Which is a bit of a rip off considering the high price!!! One can only think your quality control measures need better control and no way do they stay warm for the prescribed 8 hours stated, I get 4 and a half hours only. i am very satisfied with the product - TÅVARMER. I use them at work, walking in the forest and when I go skiing. I really love your toewarmers. and it's very cold there,I couldn't get my feet warm,but with your toewarmers my feet stays warm nearly 8 hours,it amazing!! !I have tried so many of different socks and insoles,but still my feet was cold. I gave a few toewarmers to try to my friends in the factory and they love them too,they gonna order them too!! Hi all. My dad is 92. Started buying toe warmers a couple of years ago from the Heat Company. As an older gent he finds them brilliant . I'm in Ireland and couldn't find anything to compare with these. Service is fantastic . Honestly they are nearly delivered as soon as you order. I used warmers within the safety rules, but still got blisters on my toes. They hurt a lot, and I could not walk for days. I think it is a dangerous product, and you should not use it. The company will not compensate the injuries. very happy 92 year old Dad. Dad, suffers from cold feet a lot. These are so ideal for him. He loves them. The service is outstanding, quick and reliable. Have had no problems. They are ideal for Dad, keep his feet nice and warm. A good idea. However they DO NOT last 8 hours! I have used these ten times now. They do keep your toes warm but only for 5 hrs tops. They start off really warm for the first two hours of use then start to cool down rather quickly after two hours. By 5 hours I'd say they only generate around 15% of the heat from when you initially stick them to your socks. Hope this helps! Have tried a few makes and these work well and are competitively priced but you have to keep them dry else they die. Common sense I guess, but worth knowing. Excellent product to use for children in ski boats! I have been using toewarmers from the Heat Company for a number of consecutive years. It is the only solution I have found to painfully cold feet whilst cycling. 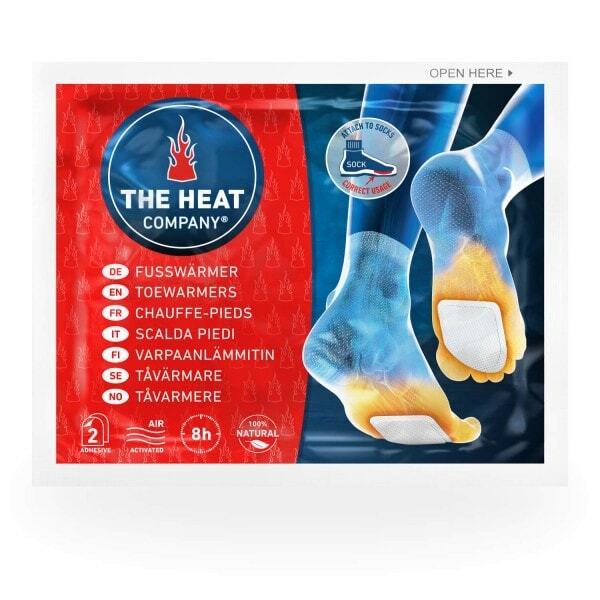 I have tried other similar products of other brands but I can definitely say that the toe warmers of the Heat Compnay are the most effective. So are the hand warmers very effective. Service is also efficient. The order takes 2 days at the most to be delivered across Europe. Keep up the good service. A brilliant product, gives a constant comfortable warmth for 8hrs. They saved me from skiing misery. I sent for these toe warmers at the last minute before a week's skiing holiday in Austria. They arrived promptly the day before I travelled. I had been experiencing frozen toes in my new Salomon ski boots (professionally fitted and seemingly comfortable) after just an hour or so of skiing at a Snowdome. Previously with hired boots I had never experienced such cold toes, which was quite ironic. On arrival at the Austrian resort the same thing happened. The next day I gave the warmers a try. I was worried that they would make the boots too tight and compromise the fit, but they didn't. I found they helped enormously. I put them on my socks at about 8.45 a.m. and they were still warm when I removed them at about 4.45 p.m. They give a steady warmth and saved my holiday from being a misery. I shall be visiting the boot fitters again to report on my frozen toes and hope they can remedy the situation. I can warmly recommend them! Life would be miserable without them! My feet are very, very appreciative of the comfort they wring. Congratulations on an excellent product and speedy service to match. Very good. Need to use them while feet still warm. I have been using these for about 4 years. You need to use them while your feet are still warm, as I find they are not powerful enough to thoroughly warm very cold feet. Having said that, they have transformed my life. I am in a wheelchair, and suffer a lot from cold feet. Cold feet = misery; warm feet = happiness. I originally thought, this product isn't too good, because I felt that the heat from the pad did not last very long (2hours), however, after writing to the Heat Company they explained the procedure again. I may just have been unlucky or have placed the item incorrectly as I am now into my 6 hour of lovely toasty toes with my second attempt and following the steps precisely. Therefore it now gets 5 stars and a big thank you from my feet! Arrived very promptly, good price. Do exactly what is required, keep feet warn on cold golfing mornings. Fit into golf shoes easily (yes, we do play golf in the winter here in Kent) and not noticeable when walking. Recommended purchase. I bought the "Heat3". All perfect, article as described, fast delivery and a good comunication. I`ll.. I bought the "Heat3". All perfect, article as described, fast delivery and a good comunication. I`ll come back for shure!! Perfect Seller! 3rd product I've purchased and will be coming back for more! Happy New Year!!! perfect seller! As described - smooth purchase- 100%ok...thank you! Great! As described - smooth purchase- 10/10...thank you! Love em! Can now tolerate walking the dog during a cold autumn day! Excellent product delivered extremely quickly and well packaged!! Many thanks from Ireland to Austri.. I used these on a skiing trip (Zillertal). I could tell they made a big difference in my comfort lev.. I used these on a skiing trip (Zillertal). I could tell they made a big difference in my comfort level while on the slopes.Temperature was in the 40s. They kept my feet reasonably warm. I have been experiencing the Raynaud's phenomenon and my fingers have always been extremely cold to .. I have been experiencing the Raynaud's phenomenon and my fingers have always been extremely cold to the point where I am unable to grasp or even take coins from by purse. I have spent a lot of money over the years, on some good quality gloves; some fleece lined but none has solved my problems. I searched on-line, found the Heat Company GmbH on the internet, and purchased their Heat 2 Outdoor PROFI. It is the best purchase I have made. This is their fingerless gloves with a flap over the fingers. As well as keeping my fingers warm, I can still use my hands without the restrictions that come with regular gloves. I also purchased their hand warmers, which warms up when exposed to oxygen and gives additional warmth. The fabric used is described as Wind Block Processed Fleece. This is exactly so as it stopped the wind getting to my fingers when worn. I appreciated these gloves more in the recent severe windy and extremely cold weather in London. I did not suffer from cold fingers as I have done in the past my. My fingers and hands were well and truly protected from the cold by my Heat 2 Outdoor PROFI. I can easily say the purchase of these gloves and hand warmers from The Heat Company GmbH is the best purchase I have ever made since I started suffering from the Raynaud's syndrome. I recommend these gloves if you like me is suffering from the Raynaud's phenomenon or extremely cold fingers and hands. In addition, the service I received from The Heat Company is exceptional their delivery time was speedy and first rate and Herwig Holzer was very helpful with my enquiries. I will rate The Heat Company 10 out of 10 for speedy and helpful service and best product. Great service, great product and fast delivery! A+++ Seller. Thanks!